If you’ve already implemented a learning management system, you’ll understand the value of great customer support. Even when an LMS runs extremely smoothly, support is still essential for getting things like authoring tools and content standards to work together successfully. Creating eLearning content can be a lengthy process, involving the collaboration of multiple tools and experts. Because a content issue can occur at any point in the process, it can be difficult to pinpoint. At LearnUpon, we invested in delivering free 24/7 customer support from the beginning. But customers are often surprised to learn that, most of the time, the support they really need isn’t for the learning management system itself. In fact, we've found that the majority of tickets our customer support team deals with are content related. If you're searching for a learning management system, that's something you should be aware of. Many LMS vendors make bold claims about the quality of customer support they deliver. But if it only covers the platform, then customers aren’t really supported at all. Here are some common issues eLearning content throws up and how to combat them. While a good LMS will be compatible with all major authoring tools, issues can arise between the two. 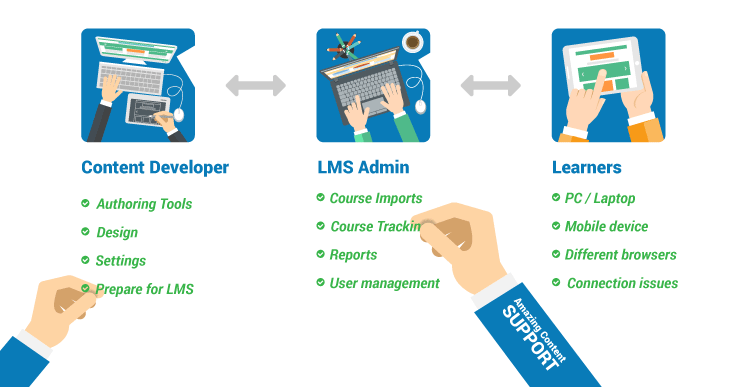 Even if it looks like an LMS has failed to run course content, the issue can often be traced to the authoring tool used to create it. If a course won’t track, for example, the LMS is often presumed guilty. But if the authoring tool failed to send interactive data, support for the LMS alone will fail to correct the issue. All of the well-known authoring tools export course content to eLearning standards like SCORM, Tin Can API, and AICC. But they don’t always follow the specs for these standards correctly. We know from experience that some authoring tools have taken more liberties than others in their interpretation of the SCORM and Tin Can specs. An instructional designer or LMS administrator is unlikely to know that the authoring tool used is at fault. That's where help from an experienced team who can identify the issue and offer specific information to pass on to the authoring tool vendor can be really helpful. Content developers are usually instructional design experts. Their skills tend to lie in the creation of interactive and engaging eLearning content. Because content developers aren’t always experts in the technicalities of content standards, and might not know your LMS, the settings they use can create conflicts that are tricky to diagnose after a course has passed to an LMS administrator. For example, you might find that your LMS won't store or allow you to report on things like specific exam questions and answers, or the length of time a learner spends on each slide. Your initial reaction might be to question why your LMS hasn't tracked the information. But in most cases, it's more likely that when your content developer published the SCORM course from the authoring tool they didn't select the option to send interaction data to the LMS. That can be easily rectified but without access to an experienced support team who can identify the issue you may end up feeling very frustrated. Other issues occur while or after eLearning content is uploaded to an LMS. Difficulties can arise if an LMS administrator chooses the wrong options when publishing the course in the LMS. For example, an admin might forget to set a pass mark on an exam. Or they might set a mastery score on a SCORM course which doesn’t contain an exam and therefore could never be passed. An LMS vendor who has built an experienced customer support team will be able to detect these kinds of common queries and quickly point you in the right direction. Learners now want to access eLearning content on all kinds of devices and in all kinds of environments. While mobile learning options can be really convenient, the technology they rely on can cause problems beyond the LMS. It can be difficult to fully control the kinds of technologies and devices learners use to access course content. The range of browsers and versions of browsers used are often a culprit. Some browser plugins may prevent a course from communicating completion statuses back to the LMS. Other issues can be generated by the dependence of SCORM and xAPI course content on Flash technology, which might not be supported by every browser. But because a learner's first reaction may be to blame the course, the help of an expert team can be needed to detect and resolve the real problem. Sometimes the problem will lie with the LMS platform itself. But those issues will vary from vendor to vendor. We know from conversations with customers who switched to LearnUpon from other learning management systems that some platforms have a lot more bugs than others. That's often the main reason they switched LMS. At LearnUpon, we're proud that very few content-related issues are caused by our platform. It's one reason why we've successfully delivered over 3 million courses since launching a few years ago. A good LMS provider understands these issues and will point you in the direction of a solution, even if they can’t resolve it themselves. That kind of support is based on deep internal expertise, developed over decades in the industry. Content standards: Your LMS provider should be able to demonstrate an expert understanding of the most important content standards, SCORM and Tin Can, but also AICC, LTI and PENS, amongst others. How can you tell if a vendor is an expert? Research the content they’ve published. Ask for links to articles and documentation. Assess how strong their blog and social media channels are. Each will be an indicator of the resources they’ve invested in making their expertise available to customers and the industry in general. Authoring tools: It's unlikely that your learning management system will operate in isolation. If you want to run engaging and interactive content, your vendor must understand all of the main authoring tools, including Elucidat, Articulate Storyline, Adobe Captivate, and Lectora. At LearnUpon, our customer support team developed tutorials to help customers and visitors with the queries they receive most often. Lisa, a senior customer support rep, wrote this popular post on How to publish to Tin Can API with Articulate Storyline 2. A little while ago, a customer contacted us about a problem they were experiencing with a popular authoring tool. Because of our support team's expertise in the area, Brendan Cregan could advise them about how the problem could be resolved within a matter of minutes. Meanwhile, they were still waiting to hear from the authoring tool vendor a few days later. If an LMS vendor’s idea of support stops at the platform, you could be in for a bumpy journey. Supporting an LMS often means providing content support - it's crucial that your LMS vendor understands that. At LearnUpon, we've built an amazing customer team that I'm really proud of. Every member of the team has deep domain knowledge about eLearning content, authoring tools, eLearning standards, and much more. As we continue to grow our customer support team, that knowledge has been passed down from Shane, Lisa and Brendan Cregan to newer members. The whole team continues to learn and expand their knowledge, which benefits our customers all over the world. If you've had negative experiences with a vendor who wasn’t able to provide good content support, either because they didn’t know the answers or didn’t care enough, give LearnUpon a try and see what real customer support is all about.